The Cambridge Fire Department responded to a 3-alarm fire at 511 Putnam Ave. in Cambridge on Monday. CAMBRIDGE — Gary Ludorf was still in his pajamas when he heard someone frantically knocking on his apartment unit’s door early Monday morning. It was his next-door neighbor rushing to warn him and the rest of the building’s tenants of smoke coming from the house’s left chimney. “We couldn’t even smell anything in our apartment yet so she’s the reason we all got out of the house on time,” Ludorf, 24, said. 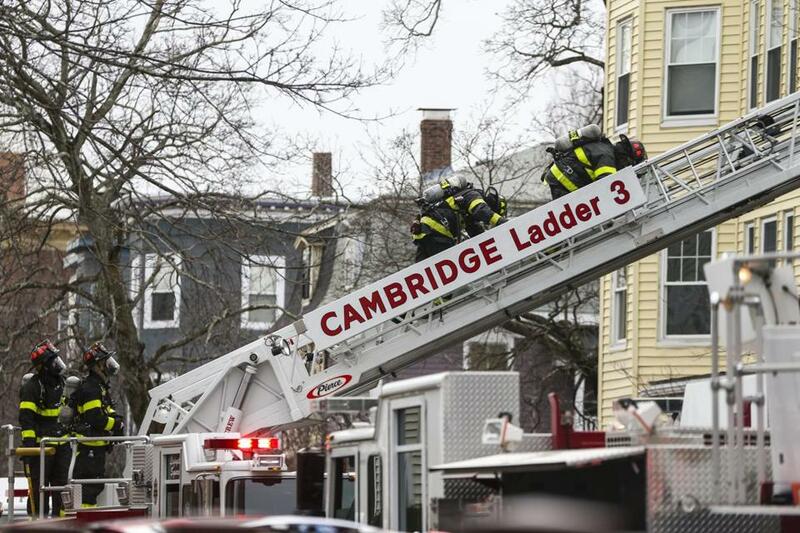 The three-alarm fire on Putnam Avenue briefly triggered a mayday response by Cambridge firefighters as some of their colleagues were endangered by a falling section of ceiling, the acting fire chief said. Firefighters first arrived at 511-512 Putnam Ave. around 7:50 a.m., Monday, to a report of smoke inside the four-unit building, according to Acting Fire Department Chief Gerry Mahoney. Ludorf, who was still wearing light blue pajama bottoms and slippers after the fire had been knocked down, said he rushed out of the house as soon as heard his neighbor knocking on doors. Margery, a 64-year-old woman who lived next door to the fire, called 911 after she and her daughter saw smoke coming from the building’s left chimney. “I looked at it and it was smoke,” Margery said. Margery said she was “still shaking” as she recalled banging on her neighbors’ doors to tell them about the smoke. “I wanted to make sure everybody got out,” she said. Mahoney said the fire was concentrated on the third floor and attic on the left side of the building and was “somewhat difficult” to access. The fire eventually required a third-alarm response from Cambridge and mutual aid companies from Brookline and Somerville, he said. A mayday call was made after a small section of a ceiling collapsed, but it was quickly canceled, Mahoney said. “There was a ceiling collapse that knocked some members down but everyone was accounted for,” he said. One firefighter was injured after slipping down stairs inside the building, and was transported to an area hospital, Mahoney said. No residents were injured, he said, adding that the fire caused an estimated $200,000 in damages. He said residents in the unit where the fire was concentrated will not be able to return home Monday, but residents on the right side of the building likely will be able to go back home. Sophia Eppolito can be reached at sophia.eppolito@globe.com. Follow her on Twitter @SophiaEppolito. John R. Ellement can be reached at ellement@globe.com. Follow him on Twitter @JREbosglobe.